The hospital care environment has always been evolving. Some of the changes have also a more direct impact on the management of the hospital. 2. Why EAHM needs a new working model? First of all we need to stress that the current main themes as such remain important. But these themes can not be treated independently. The mission of hospital managers and management of quality in hospitals are not separate worlds, on the contrary, quality gets more and more an important place in missions of hospital managers. Furthermore the (changing) hospital environment has an impact on these themes, e.g. legislation on hospital governance and, patient expectations on quality management. Therefore a working model is needed to integrate our main activities on a higher level taking into account the hospital environment. Once developed, this model may help to position and guide the (future) topics and activities of EAHM. IMPO is a working model for EAHM and its activities. It also may be used in managing a hospital, but this is not the first objective of IMPO. So it is possible that IMPO is not tailored to the context of a specific hospital but we are convinced that IMPO may help to reflect on the management of hospitals. It is neither the objective to evaluate the hospital management (and thus it has not the intention to replace those evaluation methods) but to examine the causalities between external and internal inputs and outcomes by taking into account management and processes. The model is among others inspired by the Donabedian model (for evaluating quality of care) as well as the EFQM model (excellence). But nevertheless IMPO is different from these models. The Donabedian model starts from structure, which includes all the factors that affect the context in which care is delivered. With IMPO, we prefer to start from inputs which have a broader meaning and are more dynamic (like in terms of input-output systems). Furthermore “Structure” is often confusing e.g. with governance structure. EFQM is a management model for organizations. We prefer IMPO to be a conceptual model for health care organizations and its management. As in EFQM we agree that leadership is an important element in the management of organizations. On the other hand, and as an association of hospital managers, we have to make a difference between management and processes. At the same time we have to emphasis the important interaction between both. With Inputs, we mean all what is brought externally & internally into the organization. Processes and Management are both activities of the organization. External Inputs and the created internal Inputs are translated into Outcomes through the Processes achieved by the staff and the steering action of Management. Management is a different type of activity as it doesn’t intervene in this translation on a daily or operational base. So Management activities should be separated from Processes. Management sets in an early stage the priorities through the mission as well as the objectives and the strategy of the hospital. As in the EFQM model, Leadership is one of the most important factors of Management but its importance needs to be refined: leaders direct and guide followers in the organization. So both roles are critical to the success of the organization. The outcomes should be patient centered and of societal or macroeconomic relevance. They should be measured in terms like accountability and added value. First of all, the pillars I P O are on the same level but with a different size and color, showing that Inputs are to be translated into Outcomes through Processes. Attention should be first given to the Outcomes (biggest size and strongest blue), followed by Processes and then Inputs. 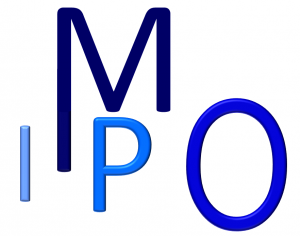 The M is not only covering the P, it is wider than the P and has one leg between the I and P, but is of course also involved in the Outcomes. Management starts its work by using or transforming external inputs (e.g. regulation, finances, progress in medicine, lifestyle, relationship with companies on the health market…) into internal inputs (by applying the regulations, by allocation the financial priorities to…). Therefore the left leg of the M is extended between the I and the P.
As indicated, Management differs from Processes of the daily work. But there is a strong link and interaction between Management and Processes in such a way that they can not survive apart: they are the operational heart of the hospital. Many more interconnections may be identified, but this goes beyond this introduction to the IMPO model. How to use the IMPO-model? It integrates the 4 components relevant in running hospitals and underlines the needed global approach. By using this model we can prioritize topics to be elaborated or documented which are relevant for the outcomes and which need to be approached under the scope of management and processes. Hospitals and hospital managers in particular have to adapt to the many changes in the healthcare sector. So must the EAHM. To guide this process, the EAHM was looking into a framework as a natural progression following on from the reflection process of 2010. The Executive Committee approved in May 2013 to go on with the IMPO model, based on 4 interconnected pillars (Input, Management, Processes and Outcomes) and decided to start a large consultation of the National Associations, the Subcommittees as well as the partners. The IMPO-model has been presented to the Subcommittees in June and July. Our associate members were informed about this model through Ehospital and were invited to participate in a website discussion. In September, the National Associations were invited to discuss the IMPO-model, using a introductory text and a shortlist of accompanying questions. This consultation process culminated in the first IMPO workshop held on the October 21st, 2013 at the EAHM-officein Brussels to which all members of the Executive Committee and subcommittees as well as our Partners were invited. The purpose of this highly interactive workshop was to project the IMPO-model on the role and activities of EAHM. and from the experience of their hospital/organisation over the European scene to the EAHM. This was done for the 3 pillars, starting with outcomes, then processes and input. 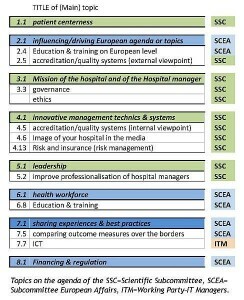 The reports of the 3 discussion groups combined with the input from the consultation process resulted in a varied list of 40 topics for the EAHM work programme. The results of the consultation and the IMPO-Workshop have been presented at the meeting of the Executive Committee which took place on November 27th 2013 in Luxembourg. Based on this The Executive Committee approved the IMPO-model and decided to use it as a working model for EAHM. Following the approval, the IMPO-model has been announced and presented during the 24th EAHM Congress. Given the impressive outcome of the 1st IMPO-workshop, a meeting of the Board was necessary to steer IMPO through the different subcommittees. The central question now was “how can we work on these issues?”. The Board enlarged the list of the topics adding 20 additional topics. Then the Board looked how the topics connect to each other (e.g. role of the hospital manager is linked to training) as it is important to give clear guidelines to the subcommittees. Through a visualization, eight main topics emerged. The following graph indicates how those 60 topics relate to those eight main topics. This covers a wide angle of topics focussing the patient, from access to hospital care, infections and hygiene to patient expectations versus patient experiences and satisfaction. Other topics concern information (exchange & privacy), mobility (incl. cultural differences) and the right offer to the patient. This means following up the current European agenda (working time, cross border care, rare diseases, centers of excellence…) but also in broader context (quality systems, accreditation, certification). This should also be taken up in a managers training on European level. Topics like evidence based management, internal contracting, internal alignment, targeting-planning-monitoring the hospital, recommendations-guidelines-check lists, operational excellence, risks and insurance, quality systems and accreditation from the internal perspective… fall under this heading. Purpose is not only to bring those to the attention of our members but also to share experiences. 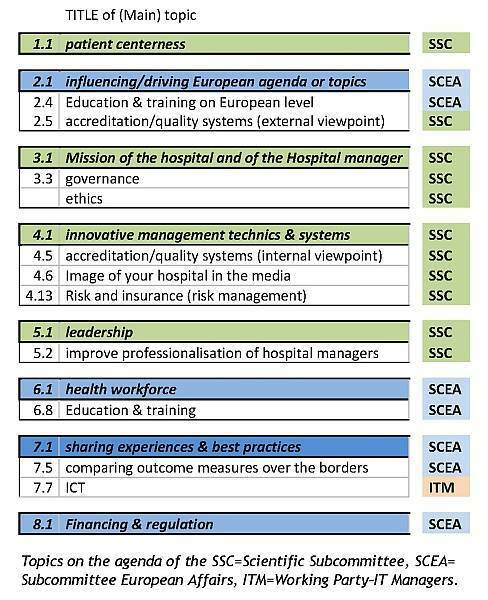 Besides effective leadership, participation in societal governance, role in innovation, cooperation in and between hospitals, competivity… are part of this main topic together with one of the main goals of the EAHM: improving the professionalization of hospital managers. This covers the ageing workforce, increase of part time staff, staff engagement, burn out, base salary funding for hospital doctors in different countries, life balance of workers, corporatism, career development, generation gap, shortage of doctors/nurses, education and training… Being crucial for hospitals, it is important that hospital managers know how to deal with these challenges. This should cover tools for managing processes, outcomes…, but also medical breakthroughs, general environment, ICT…. Theme oriented seminars might be considered for doing this. If possible, this should be done in a comparable way, for example comparing outcome measures over the borders. Reduced funding and other effects of the financial crisis provide hospital managers with many headaches as they need to keep the balance between cost, quality and access. At the same time they have to deal with health regulations and other constraints. Tools like PEST-analysis might help in taking account the different macro-environmental factors that the hospital has to take into consideration. And as money is more and more following the patient instead of the organisation of health care, hospital managers will have to deal with the financial consequences. Although some topics are difficult to link to one main topic (for example developing the future oriented hospital – linked to the mission of the hospital – has to be patient centered), the exercise made it possible to discover main topics for hospital management from experiences of the field. In order to be efficient and effective, work has to be distributed among the sub-committees and working parties. As the topics are inter-connected, the Board made a proposal of topics toward the subcommittees asking them to set the priorities. During two intensive meetings, each subcommittee looked into the list of topics and especially those that were allocated to them. These were compared with the current topics on their agenda, like quality indicators (Subcommittee European Affairs) or management tools (Scientific Subcommittee). From this exercise, the subcommittees agreed to take the topics (further) on their agenda as indicated in table herewith. Given the links between topics, the main topics “Patient Centerness” and “Financing & regulation” will be part of the work done for the other topics. Having set the work programme for the EAHM, now it is time to execute it, a task which will be taken up mainly by the subcommittees and working parties.